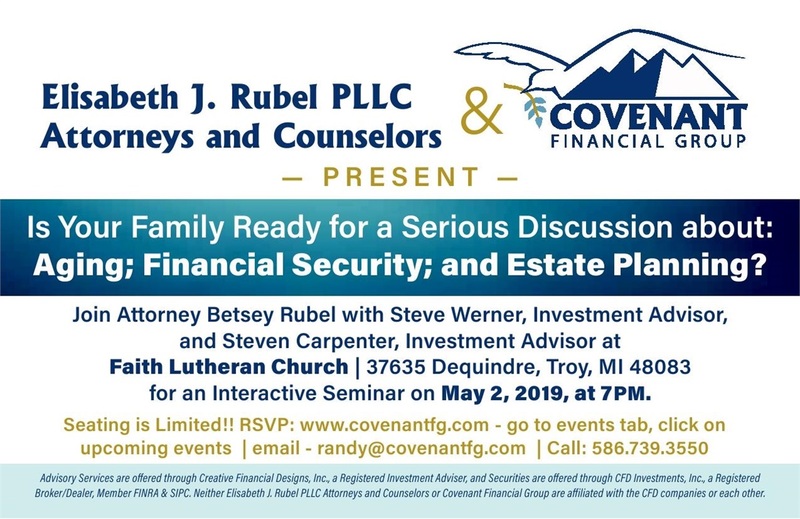 Join Attorney Betsey Rubel and CFG Investment Advisors: Steve Werner and Steven Carpenter for this Interactive Seminar on May 2, 2019, at 7:00 PM, at Faith Lutheran Church--RM 13-- 37635 Dequindre,Troy, Ml 48083. Seating is Limited!! RSVP, by clicking on the Register Tab, above. Questions? Call/Email:[email protected]/586.739.3550, for more information. Advisory services are offered through Creative Financial Designs, Inc., a Registered Investment Advisor, and Securities are offered through CFD Investments Inc., a Registered Broker/Dealer, Member FINRA/SIPC, 2704 S. Goyer Rd., Kokomo, IN 46902. Covenant Financial Group is not owned or controlled by the CFD companies.